Payment and booking form are required to complete a booking. Bookings are not transferable. Click here for cancellation policy. Courses can also be paid for by cheque made out to Mud and Wood or by electronic transfer directly into the Mud and Wood account. Please contact us for our bank details if you would prefer to pay in this way. There are a limited number of unwaged/student places on each course. Please check that there are places still available prior to booking. Proof of unwaged/student status MUST be provided at time of purchase. Failure to provide proof will result in a void booking, in which case the course fee minus an administration fee of €20 will be refunded. On this 1 day course, we will look at the components of plasters and where and when earth plasters can be used. 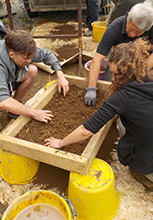 With a hands-on approach, learn to analyse soils, how to prepare your walls for earth plastering and how to apply base and finishing coats. Learn recipes for earth plasters and how to troubleshoot problems. Earth plasters aare suitable for almost all wall types: plasterboard, concrete block, gypsum plaster, stone, hempcrete and, of course, cob. Please bring samples of your own soil if you want to test if it is suitable for making your own plaster. The course will be taught by Colin Ritchie, carpenter and earth-builder, and Féile Butler, architect (MRIAI) and earth-builder in the grounds of their own earth-and-timber-frame house, completed in 2011. Classroom-based lectures will take place in the house. This is a very practical hands-on course with all workshops taking place outdoors. Bring good waterproof clothes and footwear. Clothes/footwear may get muddy. Bring a notebook and pen for theory. A hardback notebook or a clipboard is advisable if you want to take notes during outdoor workshops. Handouts will be provided. Bring trowels and a hawk (mortar board) if you have them. We have extra on site, but if you have your own, you will never have to wait around for them. Please label all personal items before arriving on the course. Accommodation: Click here for local camping and B&B and self-catering options. Directions by Car: To be sent with booking confirmation. 100% refundable up to 4 weeks prior to course start date, minus administration fee of €20. 50% refundable up to 2 weeks prior to course start date, plus administration fee of €20. No refunds for cancellations within 2 weeks of course start date. "As someone who was coming to the course with a knowledge of 'conventional' building, I was amazed by the durability of the materials and the amount of knowledge imparted by Féile and Colin. Thoroughly enjoyable!" "The earth plastering course was very practical but with a good grounding in the basic theory also. Colin and Féile both really helpful and enthusiastic and having the course in the house they built themselves is invaluable." "Both have a great knowledge of a hands-on approach to the build process. Learned simple but essential techniques which will prove invaluable to my own self-build." "I had a very good time and I learned a great amount. Course was very complete as it covered practical and some very useful theory. I will definitely keep an eye for future courses. Both Colin and Féile are very nice and knowledgable. I had a great weekend. "I've learned a lot on the course. Both theory and pracitcal very well explained and covered all aspects of earth plastering. Can't wait to find some walls to plaster. Many thanks!"